One of the longest operating restaurants in Amana, Iowa is Ox Yoke Inn. Since 1940, this full service restaurant has been serving up “family style” meals to locals and visitors alike. Open for breakfast, lunch, and dinner daily, they also offer a Sunday brunch buffet option. We want to thank the Ox Yoke Inn for their hospitality. Rest assured that all opinions are our own. Our visit was scheduled for dinner time. During the day, as we spoke with shop keepers they would ask about our dining plans. 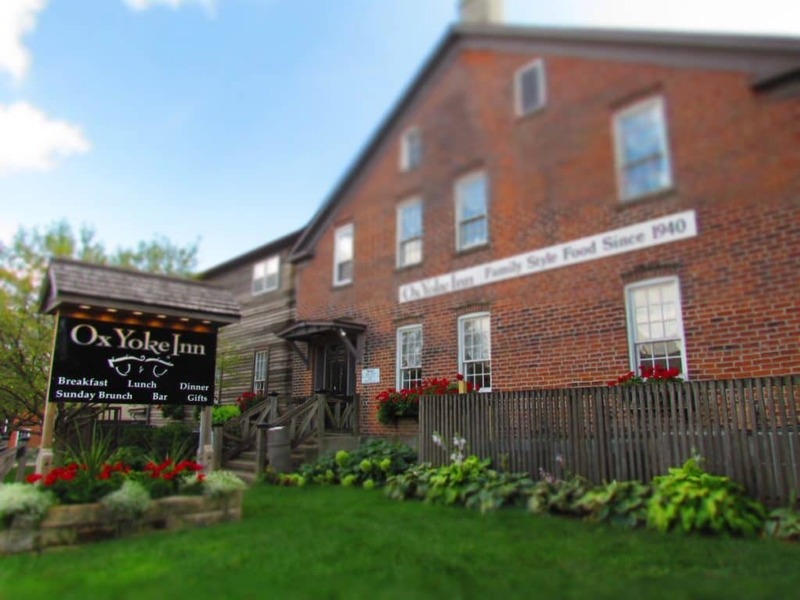 When we told them it was Ox Yoke Inn, they would all tell us about their experiences. After a day full of build up, we were ready to taste the dishes this landmark location serves up. The original portion of the building (made of brick) was built in 1856, with the woodshed added in 1870. Additions were also added in 1976, and allow them to serve the growing tourism market. Ox Yoke Inn offers a dining atmosphere that is designed to focus on the dishes. We were dressed casually, and at no time felt out of place. 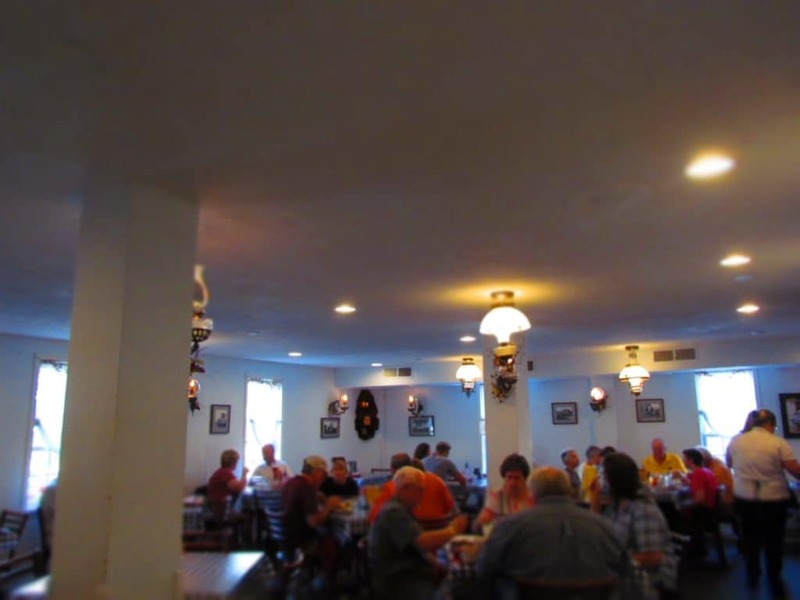 The majority of the diners appeared to be tourists, which makes sense as the entire population of the Amana Colonies being less than 2000 residents. The decor features lots of oil lamps and antiques, which lends to the old world feel. The attitude of the staff is to treat each guest like an invited friend. 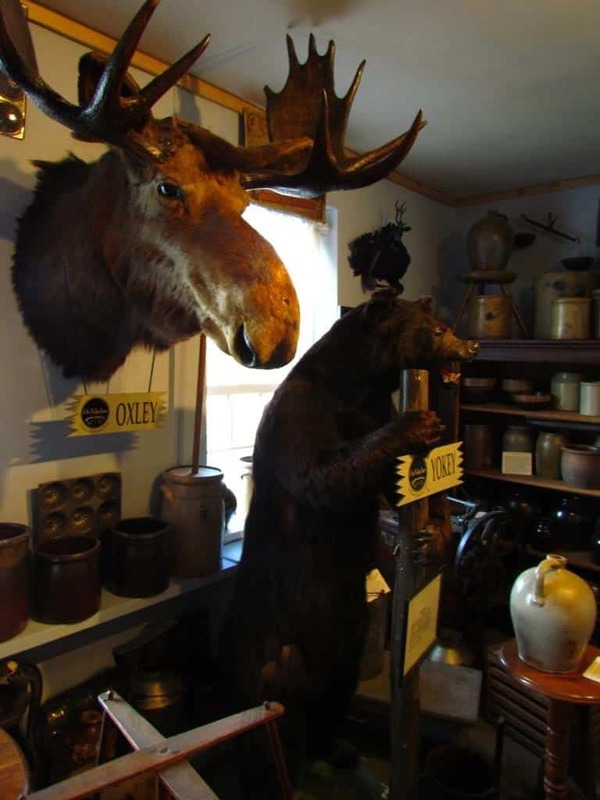 While our visit had been pre-planned by the Amana Colonies Convention and Visitor’s Bureau, we got the feeling that the treatment we received would have been the same anyway. We were seated in front of the fireplace in the main dining room. 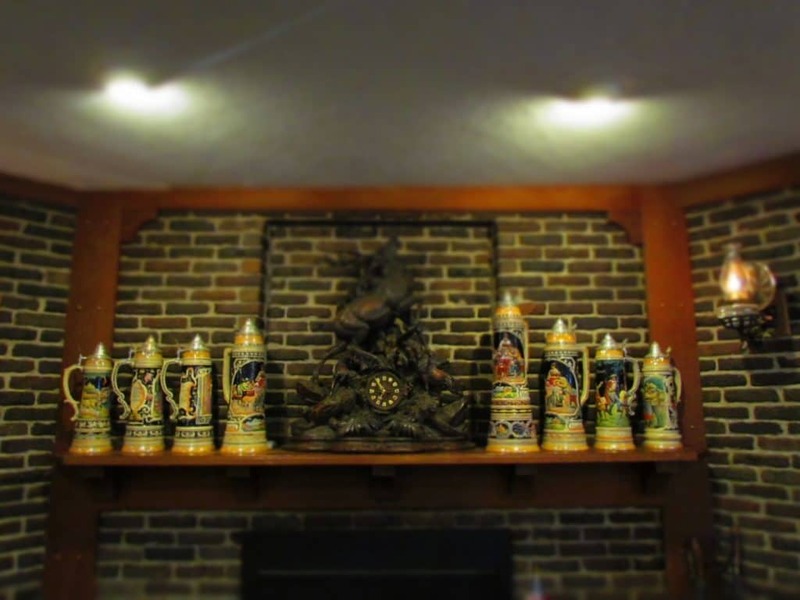 The over-sized mantel clock and steins added an Old German influence to the room. As we perused the menu, our server brought out dishes of pickled ham and pickled beets for us to whet our appetites. 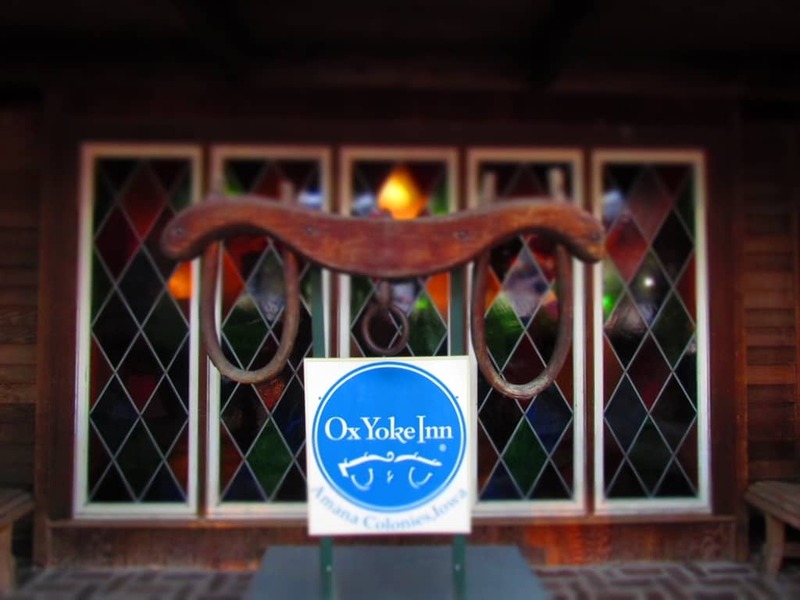 Many families dine at Ox Yoke Inn, and enjoy the value of the family-style service. This includes each person picking an entree, and then they share family-sized bowls of various side dishes. We didn’t feel this would be the best approach for two people, so we each chose a plated meal. 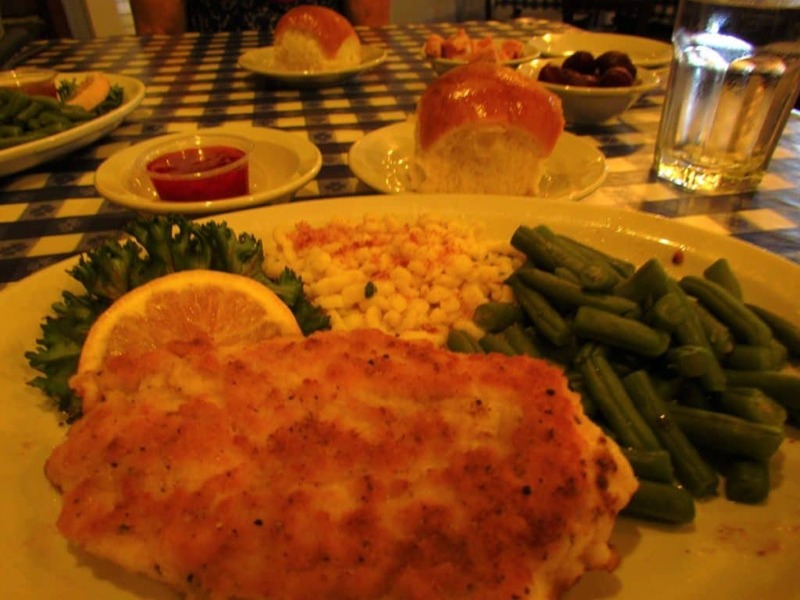 Crystal selected the Chicken Schnitzel, which is a boneless chicken breast with a cracker crust. 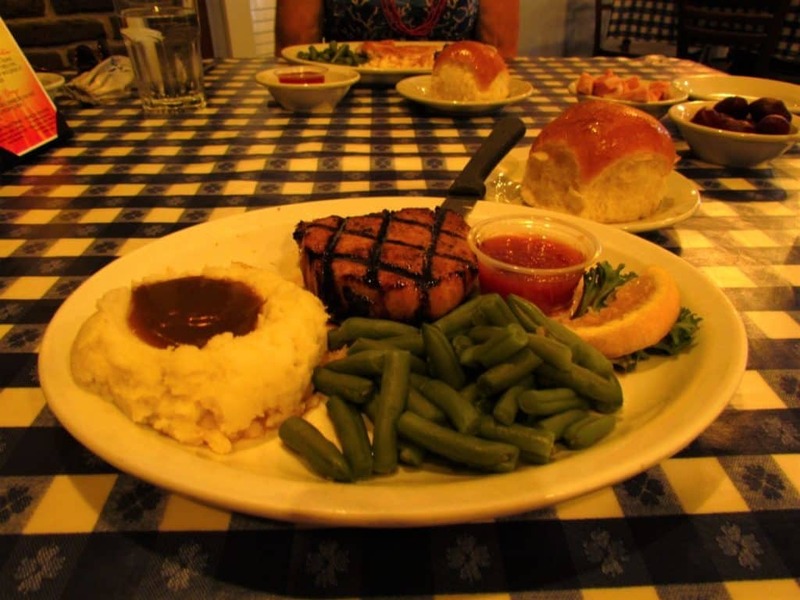 The meal also includes a couple of sides, as well as a homemade roll and strawberry jam. We shared entrees, so I did get to sample the chicken, which was tender and moist. By the time we finished our meals, we were both stuffed. 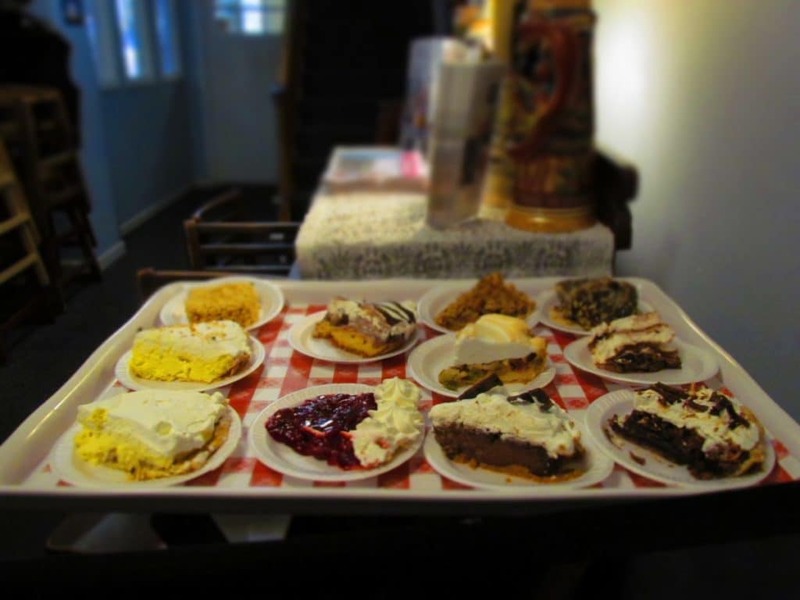 Little did we know that Ox Yoke Inn is just as famous for their homemade pies. While we were tempted to push the limits of ours stomachs, we just knew it would be folly. That didn’t stop me from dreaming about a slice of their Peanut Butter Chocolate Cream Pie or the German Chocolate Pie. Alas, we held firm, and passed on the dessert options. Unbeknownst to us, with 24 hours notice they will prepare you an entire pie to go. Next time we will need to bring a bigger cooler. We thanked our server, and the rest of the staff for our fantastic evening. As we prepared to leave, we were asked if we wanted to visit the museum. With our curiosity piqued, we made our way upstairs to the second floor. Here we discovered a small assembly of artifacts specific to the Ox Yoke Inn. There are many of the old crocks and cooking utensils that were common during the early years of the Colonies. We also had a chance to meet Yokey the bear, as well as Oxley the moose. This was certainly not something we expected, and left an amusing final note on our visit. It cemented our understanding that Ox Yoke takes their food serious, but still has a playful side. Why not try it for yourself?